Having exceeded air safety limits 56 times in 2011, Rome is limiting vehicle use in hopes of pushing pollution levels down. Photo by zenra. With climate talks taking place in Durban this week, all eyes have been on South Africa. But whether climate discussions yield binding targets or not, cities around the world are suffering the very real consequences of greenhouse gas emissions and taking necessary steps to lower pollution levels. 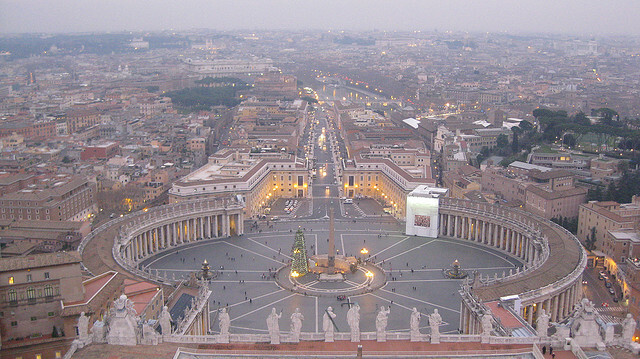 Rome, Italy, for example, exceeded air safety limits 56 times this year, according to 3news. Traffic congestion and car traffic are the main contributors to the six consecutive days of emergency level air pollution rates in Rome, and therefore the city is taking action by using partial vehicle blocks and pedestrian weekends to push air pollution levels down. The city has also been monitoring levels of nitrogen dioxide and PM10, dangerous particles that can bypass natural human filters in the nose and throat and settle into the bloodstream. The data for these particles are especially alarming, the article reports. Traffic is the main source of the alarming PM10 concentrations. This is especially evident since high concentrations are recorded next to heavy traffic areas, while the background concentrations do not exceed limits, Air Quality Europe explains. In response to the alarming levels of pollutants, the city imposed an alternate license plate system last Thursday and Friday. Only cars with even-numbered license plates were allowed in the city on Thursday, and odd numbers on Friday. Cars, motorcycles and scooters with anti-pollution devices, as well as electric and hybrid cars, were exempt from the ban. The exemption also extended to anyone driving to a wedding or a funeral, or because of an emergency situation. The effectiveness of partial vehicle blocks has come into question in the past. In this case, Rome reported visible reductions in air pollution, but such bans have also had the opposite of the desired effect. Instead of discouraging individuals to drive, the lack of mobility options has only encouraged people to purchase second vehicles, making sure they have license plates to match all restrictions. Rome has also been working to expand its limited metro system, but underground ancient Roman ruins block attempts to improve the scope of the system. The city is hoping to complete an expansion in 2012. City officials say that they are working on sustainable transportation efforts, like expanding public bus routes, and car- and bike-sharing programs. But with Italy’s new austerity measures, it’s questionable if these efforts will ever come to fruition or become popular. With transportation responsible for more than 10 percent of greenhouse gas emissions in 2005 (and steadily growing since then), it is imperative that city governments around the world explore stricter measures and more creative solutions to lower air pollution. There was a lot of uncertainty in anticipation of the Durban talks, but news coming out of South Africa shows only small improvements. Even if legally binding targets don’t come to fruition through an international system, local governments still hold the responsibility to lower greenhouse gas emissions out of sheer public health concerns.